For several years we have done activities to make Norway – and especially Geilo – more top of mind with Dutch consumers when it comes to wintersport. Since Geilo is developing quickly, Christian and I decided it was time to get some new inspiration, and so we did from 19th till 21st of April 2017. With the direct KLM flight from Amsterdam we arrived 1,5 hours later in Oslo. We picked up our rental car and so our road trip began. 3 hours, a lot of mountains, amazing road signs as “Skattebøl” (similar to the Dutch word of “sweety”) and other Norwegian beauties later, we arrived at our destination: Geilo. We checked in at our hotel: Vestlia Resort. A great hotel right at the slopes, so great ski-in and ski-out options. Sun was already setting, so we saved the skiing for the day after, but now got time to enjoy the many facilities Vestlia has to offer. After a great breakfast – with of course Norwegian salmon – our journey through Geilo began: we picked up our ski gear, made our way into the Vestliheisen Express lift and within several minutes stood on top of the Bjødnahovda on 1056 metres. To all of you who are used to the heights in the Alps: in Norway different heights apply to having good snow or not. And the fact that it’s already end of April, but the mountains of Geilo are still covered with snow proves that elevation is not an issue here. While professional skiers went up and down the red and black pistes Hallingen and Asle-løypa for some sort of slalom competition, we discovered the green and blue slopes of the ski resort. Which was a true pleasure, due to the fact that snow conditions were still perfect and we had the feeling that we had the whole resort to ourselves. We were so amazed by this experience! After a full day of snow fun, we headed back to our hotel, took a shower and went into the town of Geilo. No crazy après-ski (or as they call it in Norway: after-ski) here at the moment (winter season is almost over), but some nice restaurants with the best local food. For example Hallingstuene, a restaurant that has been in the same place, with the same chef sinds 1989, but still keeps the quality of both food and service high. We tasted some mountain trout, ate the best reindeer filet ever and ended with a lovely apple fancier. Also the wine cellar is worth a visit while dining here. The owner has been collecting the world’s finest wines – mostly from France – and has an impressive assemblage built up (which is tempting to rob, haha!). During dinner, Pål from the local tourism board, told us about the improvements Geilo is going to have. A new gondola, new ski pistes and more experience tours are amongst the things that upcoming year(s) will happen here. Upcoming winters the resort will get even more appealing for a weekend, mid-week or week of snow fun! And Geilo is not only in winter worth a visit… When the snow made way for the grass and the ice transfers back into beautiful lakes, Geilo and surroundings are perfect for hiking, biking, fishing and other outdoor activities. Seems to us like there is a good reason to come back soon. The next morning, we still could enjoy the slopes of Geilo for 2,5 more hours, before having to say goodbye to this lovely place. Just before we left, we visited some of the shops (because after all it’s end of the season here, too, which meant: SALG (sale)!) and had a great reindeer burger for lunch at another nice restaurant: EKTE. On our way to the car, we made a quick stop at the famous Snowboard Museum of Geilo. It’s one of few in the world and it’s actually worth a visit. They have collected snowboard gear since the 1980’s and hold some cool gadgets from famous Norwegian snowboarders. After that, we stopped at Cafe Mocca after it was recommended to us by a local for it’s great coffee. And also this last moment proved to us: Geilo is a pure, off the beaten track and beautiful place that is definitely bucketlist material! See you soon! The ski resort of Geilo is divided into two parts. The Kikuttoppen are great for families and beginning skiers (or those who like to take it slow) due to the many blue slopes. The Geilohovda is suitable for those looking for more adventure. 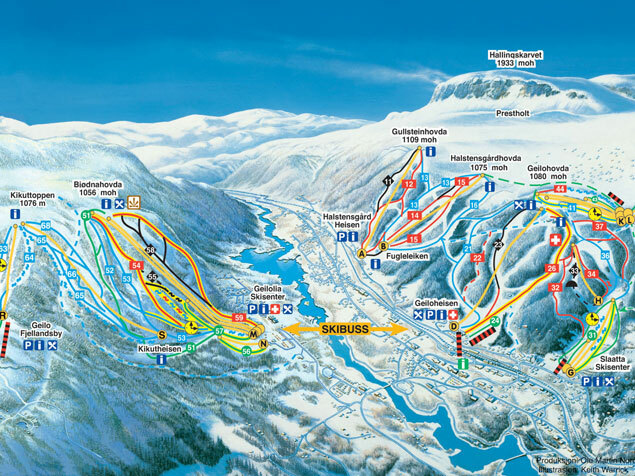 Currently, Geilo has 35 kilometres of slopes in total, but probably this will change upcoming years. Several accommodations have great ski-in and ski-out options. The ski season funs roughly from half November till end of April and there is 100% snow guarantee. Due to the location in the south of Norway, it won’t get that dark during winter, and luckily some of the slopes are equipped with great lightning. Besides skiing, Geilo is also known for it’s many cross-country options. The village is located on the highest mountain plateau of Europe, in between two national parks: Hardangervidda and Hallingskarvet. The beautiful nature is the perfect decor for the 220 kilometers of cross-country trails which are all free accessible. Also other activities are possible, such as dog sledding, fatbiking and snow kiting. A diverse wintersport holiday is awaiting you in Geilo! Take a look at Norway Home of Skiing for more information about the possibilities and different tour operators. As mentioned, we stayed at the Vestlia Resort in Geilo. It’s a good hotel with great ski-in and ski-out options. The rooms are provided with everything you need: comfortable beds, enough closet space (and clothing hooks!) and a bathroom with good shower and heated floor. The facilities range from a nice and big swimming pool and spa with sauna and jacuzzi, ideal to let the muscles relax after a day at the slopes. In the hotel bar you can enjoy a drink while watching the skiers and snowboarders coming down the mountain. The next morning a lovely breakfast with a wide range of options is waiting for you. From the hotel, you are within minutes on the slopes or at the ski rental of Geilo.